Needed to spend time in the garden this morning, just wanted the connection to the natural world. Several asclepias tubersosa were reintroduced to the garden last year. The seed pods of this one are showier than the flowers were earlier this year and I got lost studying them for a good long while. Eventually I moved on toward the front yard. For the past week the pair of crape myrtles at the end of the walkway have been shifting from green to rich orange and golden hues. I do not have the right equipment for taking good bird photographs but this pair caught my attention. 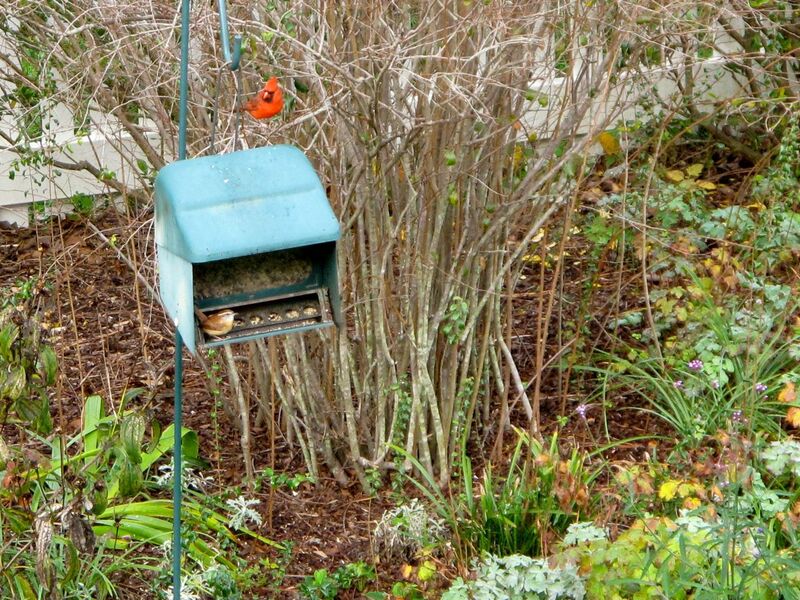 Northern red cardinals are generally very patient at the feeder and seem content to share. The small bird is, I think, a Carolina wren. Behind the feeder is a passalong Spiraea prunifolia (bridal wreath spiraea) which lost its leaves a month or more ago for some reason. It usually has nice autumn color. 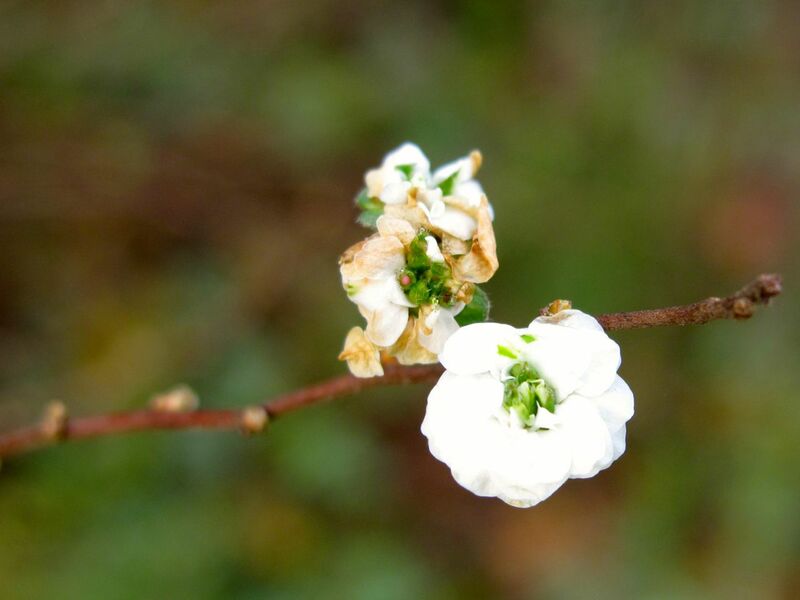 Instead of leaves, random white blossoms brave the season at the tip top of the shrub. Later in the morning, yoga class was overflowing so our mats were closely placed. During our practice we breathed in and out together, sharing our space and our energy, and connecting with ourselves and with each other. These connections and the ones found in the garden in the early morning light carried me through the day. This entry was posted in garden and tagged autumn garden, Carolina wren, Lagerstroemia (Crape Myrtle), meditation garden, nature photography, northern cardinal, Spiraea prunifolia (bridal wreath spiraea), yoga on November 5, 2014 by pbmgarden. I can see from your lovely photos that you also find your garden a place for meditation… I could get lost for hours in mine, totally absorbed in “the moment”. Hope you have many more days of connecting with your garden again this winter Susie! You understand it well Cathy. Gardens are such good medicine. Thanks. I know that feeling Susie and not being satisfied until I have got my fix of being outside. 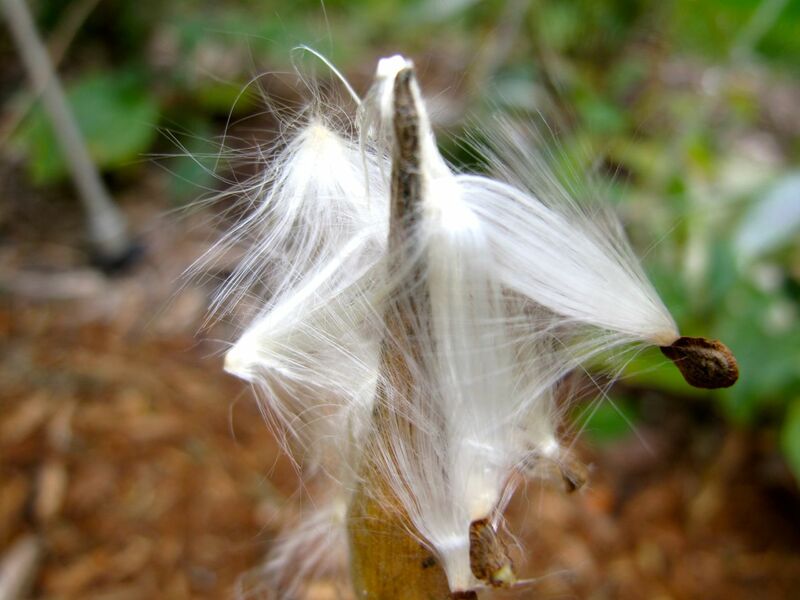 I have just googled your Asclepias tuberosa, to see if I could grow that here, it looks so tactile and beautiful. Only one seed supplier comes up, I shall have to look into this more. Your bird feeder looks interesting, is it closed in to protect from predators and weather? I’ve never seen a Monarch butterfly on my Ascepias but is provides larval food and adult nectar for them, so I like to keep some around. Hope you have luck with it. The feeder design keeps out squirrels. It also has a lever to close off the seeds depending on how heavy the bird is. That no longer seems to work–the large black birds can empty it out pretty greedily, but they haven’t been around the feeder lately. I was hoping to garden today but it looks like rain is on the way. Maybe tomorrow. 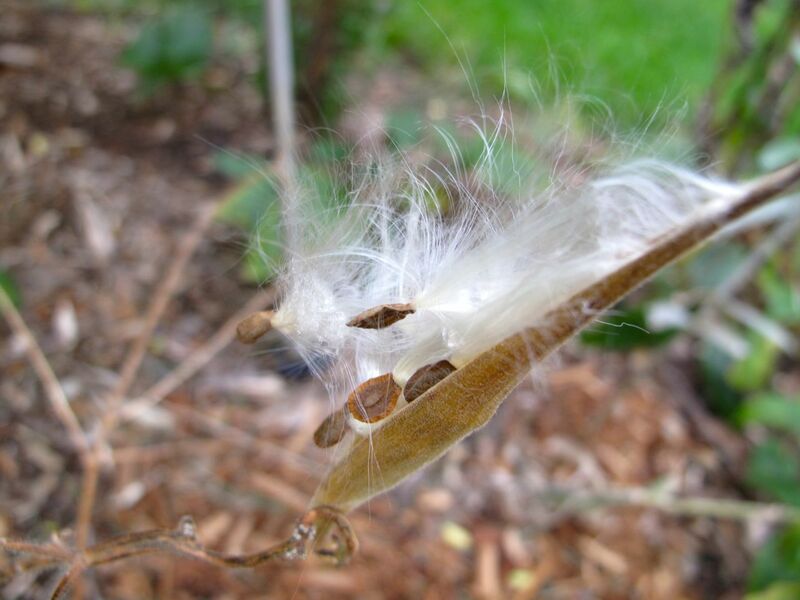 Once lofted, the asclepias seeds look like flying fairies, don’t you think? Same here Marian. I finally have a full morning free but we’re due rain also. Hope you get a chance for gardening soon. Bet your grandchildren love exploring the garden with you for fairies and friends. Like Cathy above, when I am in the garden I am totally in the moment and content, the feeling of connection with nature is so important; I’m glad you found lots of connections today. 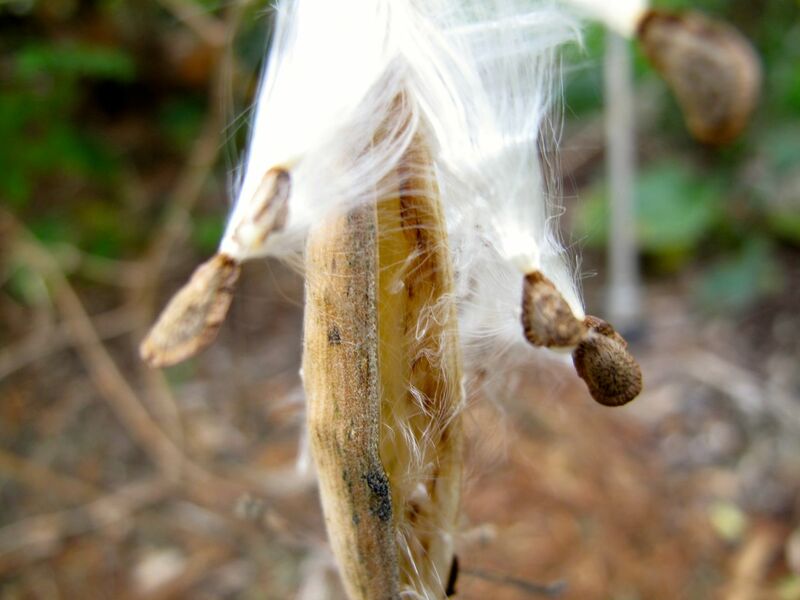 I did have an Asclepias tuberosa but one winter was too cold for it and none of its seeds grew. Christina, I feel that way too in the garden–very content and in the moment. My Asclepias died out too and the replacements don’t get enough sun. I need to move them. 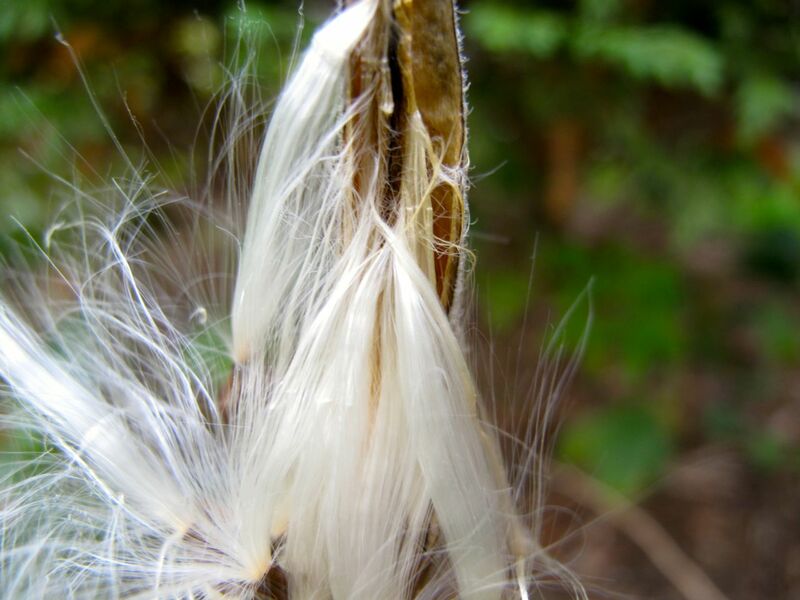 Guess I should scatter some of these seeds I found yesterday. “Needed to spend time in the garden this morning, just wanted the connection to the natural world.” That is exactly what I miss so terribly during the long winter months. Shoveling snow just doesn’t quite do it for me. I’m trying to respond to you with an encouraging message Judy, but am having trouble putting a positive spin on shoveling snow! You’re so wise to already have indoor projects lined up. I spend a few moments on my back patio every morning before work while my dogs are outside. It’s very soothing and I feel itchy and restless if it’s too cold in the winter to get my daily fix. Great way to start each day! 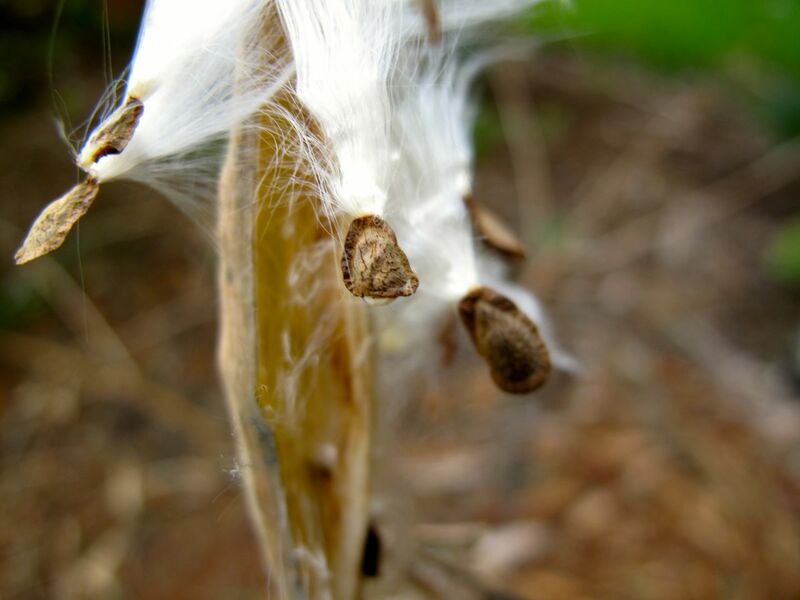 Great pictures of the butterfly weed seed. 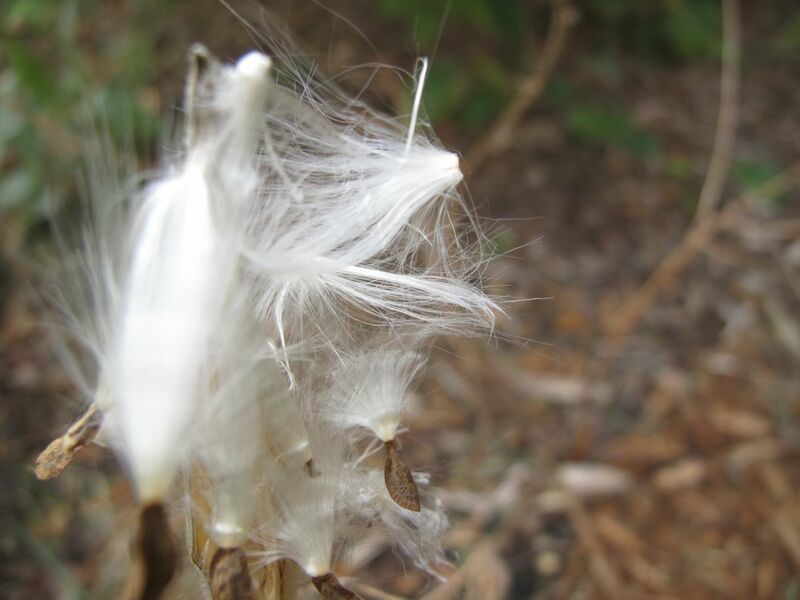 I have butterfly weed next to my mailbox and always enjoy its vivid orange color, all of the bees and butterflies that visit it, and its fluffy seeds. Thanks. Asclepias is a cheerful plant. Mine needs more sun before it can be really happy. 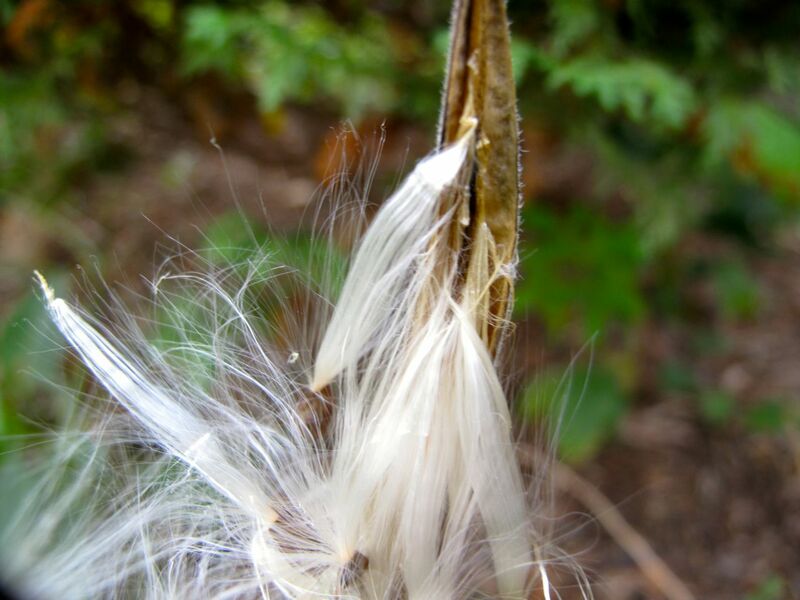 I also love the seed pods of all the Milkweeds when they burst open, but I love the flowers also. Have you been doing yoga long? 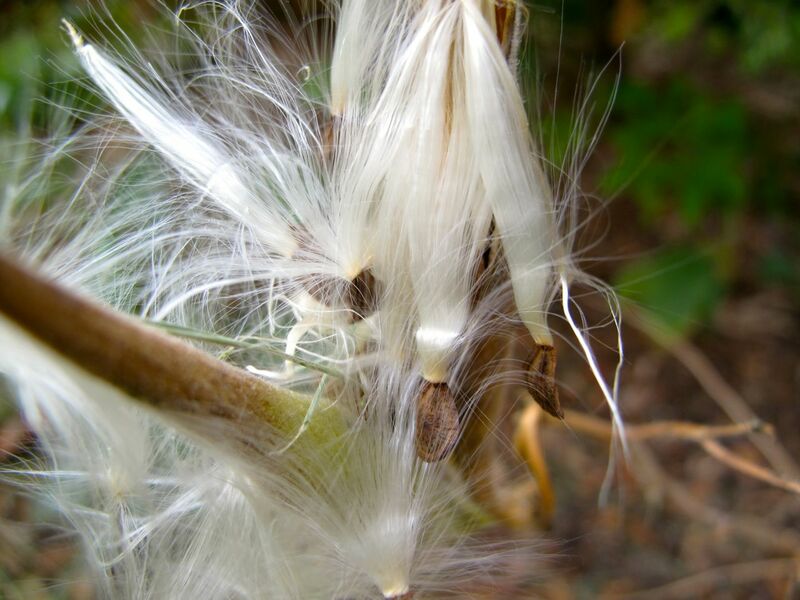 The beautiful color of the milkweed attracted me to it in the first place. I’ve been practicing yoga 9 years, most of that time 2 or 3 times a week, but now daily. Do you enjoy yoga? I’ve never tried it, but Judy has. I’m thinking about it, both for relaxation and to regain a little flexibility. Susie I love this post and the feeling of connection with nature and mankind in such a spiritual way. Thanks Donna, It’s nice to have the garden to help build those connections. Connecting with the garden is so important, I have to have my daily fix, weather permitting! We are finding evidence of more and more wildlife that shares the space with us, it is so rewarding. Isn’t it nice to have the garden to retreat to for some special moments each day? 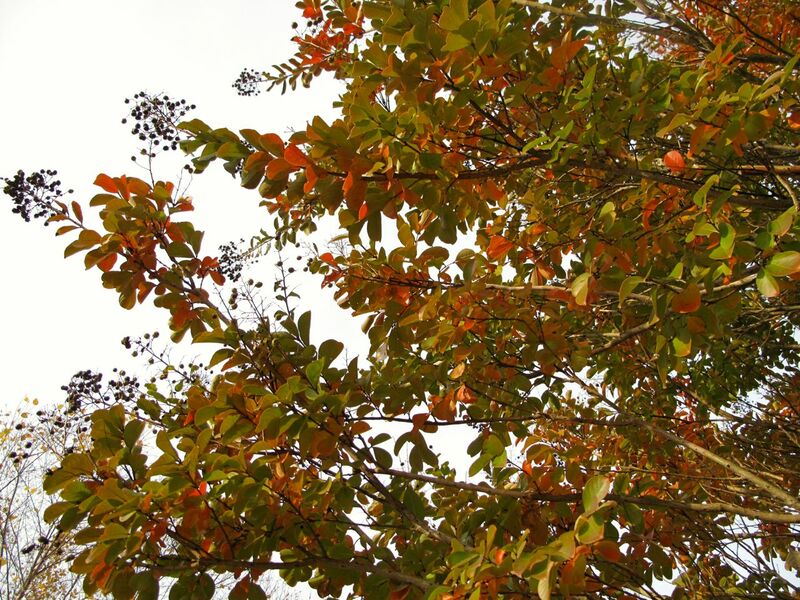 My crape myrtle has completely lost its leaves…guess it’s a bit ahead of time this year! Loving those images, really nice! Thanks Libby. I guess a few cold nights and rain made your crape myrtle decide to throw in the towel for this year. Ours is holding on to most of them still and the color has finally deepened to a nice orange.